On the 17 July, four talented students from the Royal College of Music performed an exclusive concert at Boconnoc House with delicious canapés served by Jamie Oliver’s apprentices. Each year a group of brilliant musicians are chosen from hundreds of students as the winners of the Boconnoc Music Award. The award was established by Anthony and Elizabeth Fortescue, owners of Boconnoc in 2012. The prize constitutes a week’s residency on the estate, providing them with a valuable opportunity to work intensively on repertoire and technique in a private and unique environment. This year the Kandour Quartet, formed in October 2017, took centre stage. 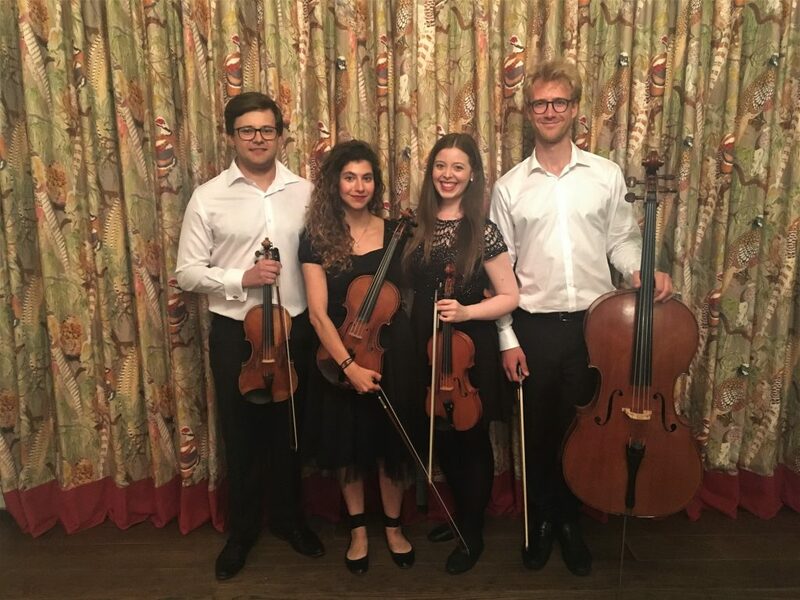 Comprising of postgraduate students from London’s Royal College of Music; Aleem Kandour, Iona Allan, Nazlı Erdoğan, and Robbie Stanley-Smith, performed a number of stunning classical pieces in the Garden Room including pieces by Beethoven, Barber and Schumann. These inspiring concerts enable classical music lovers to see top musicians in the early stages of their development in the beautiful surroundings of Boconnoc.